​ A Bike Drive became a high need when we reviewed the wish lists of children. Last year more children then ever before requested bikes. Many wanted them for fun, exercise and to do things with their friends. But we also had requests from teens who wanted a bike for transportation. ​ Although we are strict about giving new items to the children, bicycles are one of the few used items as long as they are gift worthy. Halloween Hollow is a trick or treat carnival, with over 30 games to play, on October 31st at Raven Hall on the Alaska State Fairgrounds. ​ This marvelous annual event has become a community favorite with over 2000 children and their parents. Admission is $6.00 per person or a new unwrapped toy. Hours: 3:00 to 8:00 P.M. Title Sponsor: Alaska Family Services. Major Sponsors: Q99.7 Radio, the Mat-Su Special Santa Program, Toys for Tots, I.B.E.W., M.T.A. and the Mat-Su Health Foundation. Festival of Trees is a main attraction of the Greater Palmer Chamber of Commerce Colony Christmas. ​ Twelve beautifully decorated trees will be on display around Palmer from Thanksgiving until Colony Christmas. Each tree has a unique theme. December 8 and 9, the trees can be seen and bid on at the Palmer Depot. The trees include gift cards and 'special' gifts from various businesses. 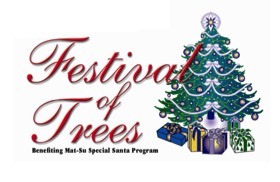 Community members may buy a ticket for $1.00 to win one of the 4' trees. The final drawing is Saturday, December 9 at 3:00 P.M. at the Palmer Depot.